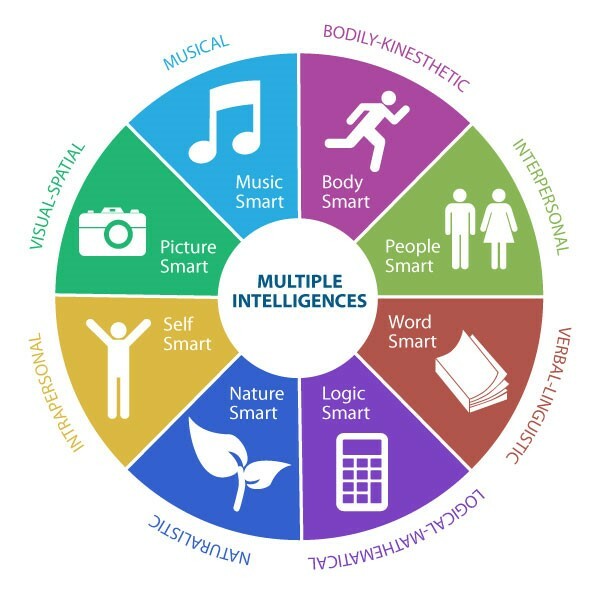 Dr. Howard Gardner, a psychologist and professor of neuroscience from Harvard University, developed the theory of Multiple Intelligences (MI) in 1983. The theory challenged traditional beliefs in the fields of education and cognitive science. Unlike the established understanding of intelligence — people are born with a uniform cognitive capacity that can be easily measured by short-answer tests — MI reconsiders our educational practice of the last century and provides an alternative. According to Howard Gardner, human beings have eight different kinds of intelligence that reflect different ways of interacting with the world. Each person has a unique combination, or profile. Although we each have all eight intelligences, no two individuals have them in the same exact configuration — similar to our fingerprints. Having an understanding of yourself; knowing who you are, what you can do, what you want to do, how you react to things, which things to avoid, and which things to gravitate toward. We are drawn to people who have a good understanding of themselves. They tend to know what they can and can’t do, and to know where to go if they need help. The ability to understand other people. It's an ability we all need, but is especially important for teachers, clinicians, salespersons, or politicians -- anybody who deals with other people. The capacity to understand the underlying principles of some kind of causal system, the way a scientist or a logician does; or to manipulate numbers, quantities, and operations, the way a mathematician does. The ability to represent the spatial world internally in your mind -- the way a sailor or airplane pilot navigates the large spatial world, or the way a chess player or sculptor represents a more circumscribed spatial world. Spatial intelligence can be used in the arts or in the sciences. The capacity to use your whole body or parts of your body (your hands, your fingers, your arms) to solve a problem, make something, or put on some kind of production. The most evident examples are people in athletics or the performing arts, particularly dancing or acting. The capacity to use language to express what's on your mind and to understand other people. Any kind of writer, orator, speaker, lawyer, or other person for whom language is an important stock in trade has great linguistic intelligence. The capacity to think in terms of music; to be able to hear patterns, recognize them, and perhaps manipulate them. People who have strong musical intelligence don't just remember music easily, they can't get it out of their minds, it's so omnipresent. The ability to discriminate among living things (plants, animals) and sensitivity to other features of the natural world (clouds, rock configurations). This ability was clearly of value in our evolutionary past as hunters, gatherers, and farmers; it continues to be central in such roles as botanist or chef.